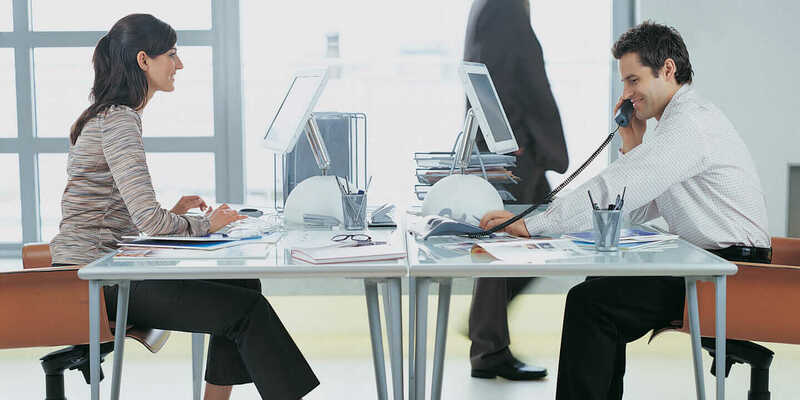 Shared Office Space Pros and Cons: Share or Not to Share? For an architect, working from home can be a dream. Notorious for long nights spent over drafting tables and designing on computer monitors, architects may find working from home to be the perfect way to manage business operations. After a long night of drafting and designing, an architect can simply shut off the lights and be done for the day, ready to crash for the night. After a while, though, this arrangement may become more exhausting than convenient. Being able to work through the night at your own home may mean you begin taking on long hours more often than necessary. Some entrepreneurs also begin to experience the “work from home blues”—a sense of loneliness and isolation that can come as a result of holing up alone in your house or apartment all day. For those who are beginning to tire of the work-from-home model, there is a solution: shared office space. These spaces can be rented out for daily, weekly, or monthly use, and are a spot where even lone-wolf workers can go each day to get a little human interaction while still maintaining independence. As with any work arrangement, though, there are some distinct positives and negatives for shared environments. Keep reading to find the pros and cons of a shared workspace. 1. Find Your Niche. Working at home can be lonely, and if you’re having trouble remembering what it’s like to have a conversation with someone besides your cat, it may be time to look into a shared workspace. Most office spaces have communal kitchen areas with free coffee and water, as well as break rooms, which are perfect for meeting people. If you’re looking to know other architects, designers, or creative individuals, you can look for a workspace that welcomes people just like you. You’ll be able to find a community of independent thinkers who are similarly in need of a little company. And if you really enjoy those chats with your pet, that’s no problem, either—some shared office spaces are even pet friendly. 2. Access to Amenities. You may be doing just fine in your home office, but chances are you’ve found yourself in a bind when suddenly you realize you don’t have something you need. Maybe you’ve encountered a client who insisted on color printouts of a document or asked you to fax over a contract. Shared office spaces offer simple and direct solutions to this problem. Communal spaces usually come fully equipped with standard office amenities, such as printers, scanners, and access to conference rooms. With a shared office space, you can welcome prospective clients to meet with you in a modern and impressive conference room. Some shared spaces even have administrative assistants who are available to field phone calls, provide guidance with professional mailings, and make sure the office is running smoothly. 3. Group Motivation. When you’re operating entirely from home, it can become difficult to remember what a normal workday feels like. According to the New York Times, shared office spaces surround people with others who are motivated and present every day to work hard. That motivation can be infectious and positively affect your work. At the same time, you’ll also be able to see that taking a lunch break and leaving before dawn is the norm, inspiring you to take a healthier outlook on work each day. 1. Disagreements Among Co-Habitants. None of you work together, yet all of you occupy the same space. While sharing an office can be great for meeting others, it also means you may occasionally get in each other’s way. You may rent a space only to find out that you’re sitting next to someone who makes cold calls all day, or discover that you have to book the conference room for a one-hour meeting a week in advance, making it difficult to bring in clients. These issues may not be deal breakers for many, but if you think these bumps in the plan will end up being more trouble than they’re worth, then sharing an office likely isn’t for you. 2. Cost. Shared workspaces don’t have to be expensive. In fact, many offer reasonable rates and schedules, allowing you to rent out the area just a few days a week. However, if you’re strapped for cash and find yourself working late into the night to keep your architecture dreams alive, you may want to put off renting out a space for now as a way to reduce business costs. It’ll save you financial stress—something we can all do without. 3. Lack of Control. It’s too hot or too cold. You can’t play music through speakers, and you will never know whether you’ll be able to walk over to the kitchen and find it as clean as you left it. These things may get to you after a while, especially if the owner of the building decides to add more desks to the space in order to bring in more revenue, exacerbating current problems and making you feel cramped. The point is, when you sign up to work on someone else’s property, you’re going to have to give up a certain level of control. If you like things a certain way and need to feel control over your personal environment (which is totally fine! ), then shared workspaces may not be the right fit.